HONOR YOUR PARENTS WITH A SPECIAL GIFT ON YOUR WEDDING DAY! It is traditional for Jewish children to honor their parents throughout their lives. On your wedding day, a special gift of respect and thanks to your parents can create a treasured memory of a lifetime. 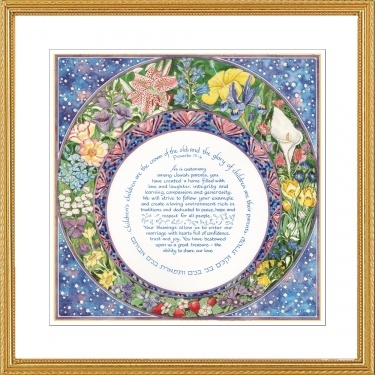 The parents’ gift, by artist Mickie Caspi, was designed with this in mind – it is a gift from a bride and a groom to give to their parents on the wedding day. It recognizes parents’ tremendous effort in the difficult task of raising children and creating a loving home. The Blue Sky is overflowing with Stars of David and lush flowers. Gold frame with White mat. As is customary among Jewish parents, you have created a home filled with love and laughter, integrity, and learning, compassion and generosity. We will strive to follow your example and create a loving environment rich in traditions and dedicated to peace, hope and respect of all people. Your blessings allow us to enter our marriage with hearts full of confidence, trust and joy. You have bestowed upon us a great treasure--the ability to share our love. As an option, you may personalize the Blue Sky print with a black/gold 1" x 3" plaque, to be affixed on the bottom of the Framed Parents' Gift. $25. Up to three lines. Please check below and fill in names, dates, and small message, if desired.